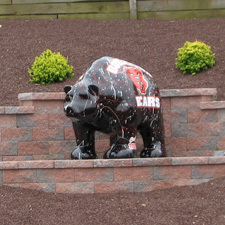 “Al” was designed by Boyertown Area Senior High School science instructor Clint Musser and fabricated by Jeff Graber of Graber Letterin’ and features the school’s colors applied to create a celebratory theme and to serve as the mascot for the Class of 2005, the class that welcomed a dozen Bear Fever bears to their graduation ceremony. 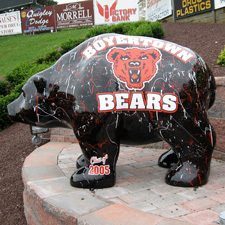 Bear Fever had debuted May 7, 2005, during the annual Arts Expo; “Al” stands as a testament to the artistic and communication skills offered by the district’s students throughout the development of the project which began the year they entered as sophomore students. Student involvement and support served as a unique feature of the project and contributed in great measure to the project’s popularity and success within the community. 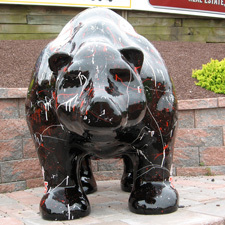 Bear Fever: Look out or it will get you! By Elise Sherman When my perky English Teacher, Jane Stahl, first shared the idea of Bear Fever with me, I was all-ears and almost simultaneously agreed to take part in it. I must admit that I really had no clue as to what I was getting involved in, but that didn't stop me because I was eager to lend a helping hand in a new and interesting project. At one point, I recall declining my offer of involvement because I was so intimidated and overwhelmed at the amount of work this project seemed to require. Once Mrs. Stahl tenderly encouraged me that I could handle it, I became a girl with one thing on my mind. 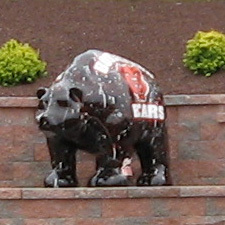 I had to complete my mission: the mission to track down the undiscovered and irreplaceable Graber Bear. And so began my hunt for this rare bear. One afternoon, despite the gray overcasts and trickling of rain, I was feeling lucky. Acting spontaneously on this feeling, I telephoned Jeff Graber's business, in hopes of catching him before he ventured off. As he escorted me into the garage of the building, I was surrounded by an aroma of sawdust and pine trees. A clean smell, it was, yet unfamiliar. I chuckled to myself as I was taking "shots" of the bear and Jeff because he was very concerned about the small stain on his shirt being noticeable in the photos. I reassured him that I would stand far enough away. So, thus ended my first encounter with Mr. Jeff Graber and his incredible bear. Mission complete, except for the fact that I found out little to nothing about Mr. Graber, personally. It wasn't until three days later, when his information got back to me, that I discovered a little more was well worth the wait. If there was one word to describe Jeff Graber, it would be BUSY! When he is not perfecting is graphic art in his full-time business, spending quality time with his girls, or designing elaborate pieces of work for Bear Fever, he somehow still manages to go hunting, watch NASCAR, and keep up with his football. This is one dedicated man in all his endeavors. In Jeff's earlier, he was always skilled in art; and since he had an interest in lettering racing cars, he started a small business that rapidly grew. In 1990, working out of his own basement, he lettered race cars, trucks, and signs. It wasn't until two years later that he established his business as a corporation and moved to present location behind Earl School. Jeff hopes the project is a success and that the people appreciate the time all the artists and sponsors have invested. Mr. Graber is a very talented man and it was my privilege and honor to have adopted his bear.